Public Services- Telangana Government Life Insurance Department- Telangana Government Employees Group Insurance Scheme-1984-Revision of Groups consequent on implementation of Revised Pay Scales-2015-Orders-Issued. In the reference 1st read above, orders were issued to introducing Group Insurance Scheme to the State Government employees in place of Family Benefit Scheme w.e.f.01.11.1984. In the referred Government orders, the employees have been classified into (4) groups i.e. Group A,B, C, and D depending upon the scale of pay drawn by them. The Revised Pay Scales, 2015 have been implemented vide reference 2nd read above, to the State Government Employees. In the reference 3rd read above, the Director of Insurance, Telangana, Hyderabad has proposed to revise the groups with reference to the Revised Pay Scales, 2015 and issue necessary orders as it has become necessary to regroup the employees under the Telangana State Employees Group Insurance Scheme with reference to pay drawn by them. 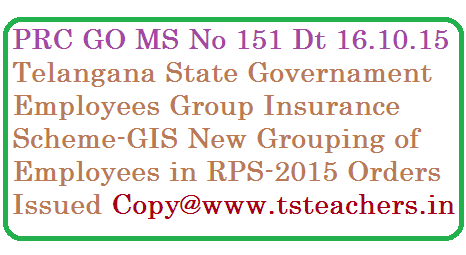 Government after careful examination of the proposal of the Director of Insurance and the implementation of the Revised Pay Scales-2015 to the State Government Employees, hereby order that the Employees shall be grouped into the following categories for the purpose of the Group Insurance Scheme with reference to the Revised Pay Scales, 2015. The above revision of Groups was proposed to effective from February, 2015. The subscription as per the revised groups shall be recoverable compulsorily each month. There is however no change in the insurance cover i.e. the amount of insurance cover shall be Rs.15,000/- for each Unit of subscription. The date of assumption of the charge of a higher post and the date of orders of the reversion to a lower post shall be taken as a criteria for determining the change of Group. In case of appointment to Automatic Advancement Scale, the date of orders shall be taken as a criteria for change of higher group. The Drawing and Disbursing Officer shall be held responsible for recovery of correct subscription in respect of the group to which the employee belongs and in case of failure, the difference due shall be recovered from the Drawing and Disbursing Officer concerned. Directorate of Insurance, Telangana, Hyderabad, through his subordinate officers shall conduct a regular audit of all claims under Group Insurance Scheme and send a report to the Head of Departments concerned for any lapse. The Head of Department concerned shall take action against the erring officials who are responsible for the excess/less recoveries wherever they are detected. If an employee’s subscription is not recovered during his service period, the total subscription along with interest shall be recovered from the payments admissible to him. The Head of Departments shall take prompt action for recording the necessary subscription entries in the Service Registers of the Employee under proper attestation every year i.e. April to March. Group Insurance Scheme payment sanction orders including calculation slip should be sent to the Directorate of Insurance for verification as per orders issued in G.O.Ms.No.910, Finance (Admn-II) Department, dated.28.10.2002. The Director of Treasuries and Accounts, Pay & Accounts Officer and Director of Works and Accounts shall take necessary action to arrange to send the details of Receipts and Payments Group – Wise in Annexure B and ED to the Director of Insurance, Hyderabad every month without fail. In so far as the persons for whom the claims arose during the period from June, 2014 to September, 2015, the settlement as per the old slab rates and there shall be no recovery from such persons.